It seems that the House GOP is moving forward with plans to push for a new investigation into the IRS’ misdealings and they hope to send a few people to prison in the process… specifically former IRS boss Lois Lerner. The Obama Administration was very dismissive about the crimes that we believe Lois Lerner committed. And those are strong words that I’m using but the House Ways and Means Committee voted out a criminal referral to the Department of Justice which was completely dismissed by the Department of Justice. President Obama was on television at one point in the midst of the investigation, Stuart, and he said there is not a smidgen of wrongdoing here. So, look, we think that Lois Lerner did particularly two things wrong. Number one, she denied people due process and equal protection of the law based on their political philosophy. We’re convinced that there’s overwhelming evidence to suggest that that’s true. And that’s a felony. Secondly, we believe that she lied to the Inspector General of the Treasury Department when they were investigating that very thing. What we want is a new Justice Department to take a fresh look at this while we are well within the statute of limitations, and if they can move forward with a prosecution. On Wednesday, Ways and Means Committee Chairman Kevin Brady and Tax Policy Subcommittee Chairman Peter Roskam sent a letter to AG Sessions telling him that their committees had gathered an extensive amount of information while investigating the IRS scandal but that Obama’s Justice Department refused to consider the material. Instead, the Obama administration ignored the evidence and pretended as if nothing had happened. 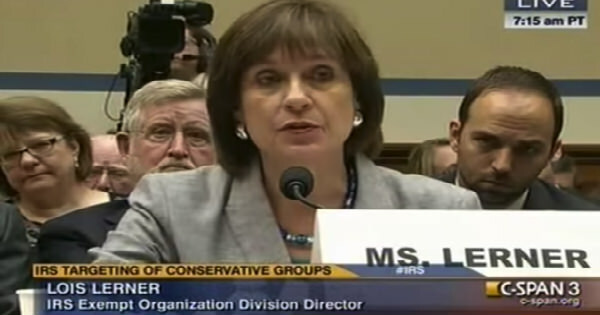 According to Brady and Roskam, there is clear evidence that Lerner was involved in criminal activity during her time as the director of the Exempt Organizations Division of the IRS. “On April 9, 2014, the House Committee on Ways and Means voted to send a letter to the Department of Justice referring former IRS Exempt Organizations Division Director Lois G. Lerner for criminal prosecution. As indicated in the attached letter, the Committee’s nearly three-year investigation uncovered evidence of willful misconduct on the part of Ms. Lerner. Despite this fact, and for what many believe were purely partisan reasons, the prior Administration refused to review Ms. Lerner’s misconduct…. Otra Nation: The Mexico/U.S. Solution from the Future or Liberal Daydream?Watergate Icon Bob Woodward Praises Trump as a "Pragmatist"